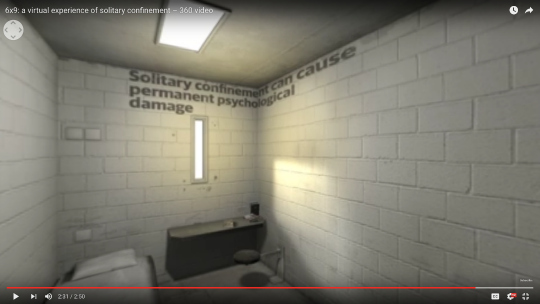 A screenshot from "The Guardian's" virtual reality project on solitary confinement shows Professor Craig Haney's words projected onto the walls of a virtual prison cell. UC Santa Cruz psychology professor Craig Haney is a key adviser in a virtual reality form of journalism, 6x9 - a virtual experience of solitary confinement, by the British newspaper The Guardian, that places viewers into a virtual prison cell. The Guardian's first virtual reality project aims to highlight the psychological and physiological devastation of solitary confinement. Viewers can experience what being in solitary confinement is like thanks to the Guardian’s computer-generated reconstruction of a cell. When "inside," viewers can explore what they can and canot do in solitary confinement through the immersive exhibit. The project includes an interactive website with podcasts, video, prisoner stories, op-eds, as well as a mobile phone app. “There are physical and physiological consequences of being deprived of human and social contact so that people’s brainwave patterns are altered and certainly people who are in these environments for many months or years on end have to change and transform who they are and so they are damaged,” Haney says in the piece. Haney was also interviewed for a podcast that discusses the psychological effects of isolation.